As a recruiter, you know that a challenge is up ahead when you’re tasked to look for data scientists, cloud engineers or any tech related role. Their skill set is so specialized. Competition is fierce. And every other recruiter or company is after them. In fact, finance and industrial companies are hiring more developers than software companies! A compilation of the best jobs of 2017 reveals that tech roles are the highest in demand in terms of postings, salary and growth opportunity. And with this level of competition, it’s almost impossible to lure talent based on benefits alone. Recruiting for technical positions require an updated and a fresh approach. Aside from the usual sources, try expanding your database of potential recruits to online niche communities and job boards. Jason Pinto, Director of Marketing, CBG Benefits shares that among the advantages of the Internet is that different people are able to connect and collaborate with like-minded people. With this, it’s valuable for companies to seek out where these people are and then use that platform to attract talents of a specific profile. So, go ahead and turn that job ad into a social card – you may actually find your next developer over a Facebook post. As we speak, your potential tech hires are probably googling your company online or checking out your Linkedln page. Make sure you capture their interest by producing content that matters to your prospects. Remember: how you market your company online can help drum up interest about your company and the careers you offer. You’ll be sure to encounter a lot of potential tech hires, but be sure to zero-in on your top picks by offering unique compensation packages that are most relevant to their needs. This helps you to get to know these candidates better, find out what their career priorities are, and make informed compensation packages. Maybe they’re looking forward to mentorship. Perhaps they need a relocation allowance. Focusing on your priority candidates makes your potential hires feel that you have their best interests in mind, and they are more likely to accept your offer. Luan Lim of recruitment firm AppDynamics notes that their recruiters operate like sales agents. They have monthly targets, and their metrics of success lies in having a pool of candidates that are poised to consider employment though them. Let’s face it: tech roles are comprised of very specific skills or capabilities that an interview or a CV review can’t really assess. One effective workaround is to team up with a tech expert or rely on employee referrals. Not only will this expand your recruitment pool, but this will also help you make informed hiring decisions. Did you know that more workers feel that working offsite improves their productivity? You can capitalize on this by offering prospective hires offsite or remote working options. This is especially relevant for output based technical positions. Just make sure to exert the extra effort to make remote staff feel like they’re still part of your company’s culture. For senior or executive tech positions that require moving to another city, an excellent relocation package is a must. During the recruitment process, make sure to fly them in, conduct in-person interviews and showcase the best of your city. Find out what their priorities are – Is it a good home in the suburbs? Schools for the children? Or maybe a local basketball team they can support? – and make sure that that you present them with options. It’s also key to outline a concrete career path that they can expect from your company. Always remember that these potential tech hires are investing both their professional and personal lives in your company. If you find immense talent gaps in your organization, you might want to consider setting up satellite offices. Research demographics and find out which cities have the technical talent pool you need. Who knows? An offshore software development team in Manila or Seattle may be your answer. Sometimes recruiters are too fixated on looking for a particular technical skill set. And the downside of this? A significantly narrowed down talent pool. Try to get past the skills gap, and focus on training potential candidates. After all, online learning courses, one-on-one mentoring, and employee immersion are ways to develop emergent skills among your potential tech hires. 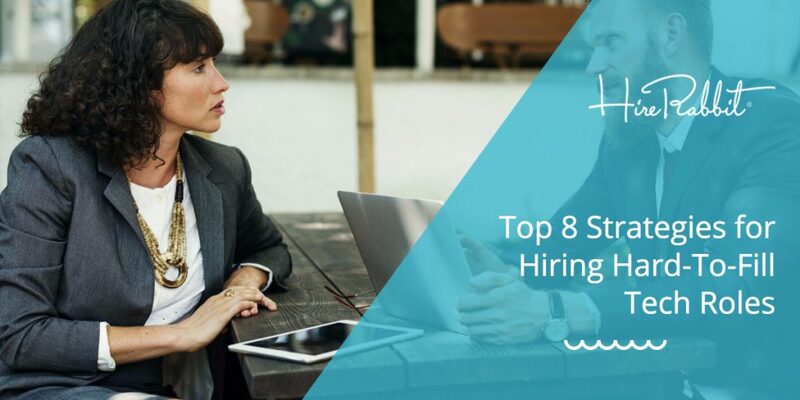 We all know that talent especially for technical or other in-demand positions won’t exponentially increase anytime soon, but taking one or all of these strategies might just lessen your hiring gaps. Remember to combine traditional techniques such as job placements with more unique approaches such as sourcing through niche online communities and offering flexible working options. You can also visit our website for more strategies on hiring for tech roles or other hard-to fill positions. Do you have your own tried and tested recruitment tips you can give? Share them in the comments below.